If you liked my 7 minute video post of Seve in his prime going through his warm up routine on the practice ground you'll love this. This is one of my favourite videos ever. 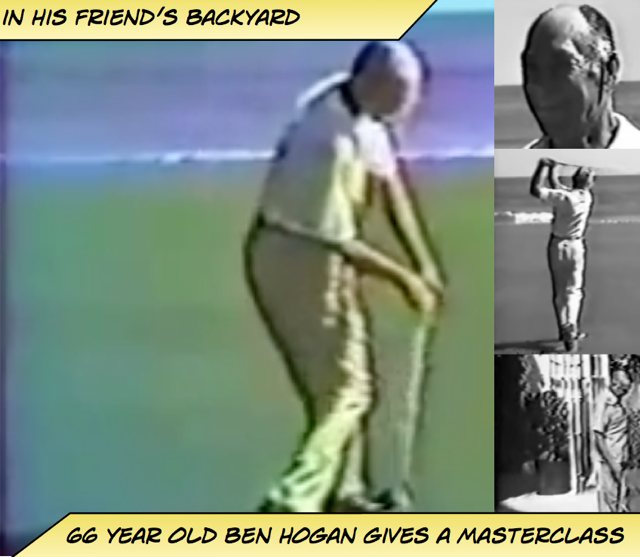 The then long retired Ben Hogan hits drives into the ocean from the backyard of his friend George Coleman's house. Then gives a swing masterclass. The year was 1977 and Hogan who had just turned 66 was on a final visit to friend George Coleman in Florida. The pair often played at Seminole, the course Hogan used in his prime to prepare for The Masters. As the story goes, Coleman had just purchased a home video camera and wanted to film something. Up hopped Hogan from his rocking chair and said "I'll hit some balls into the ocean for you." What they produced, though poor in quality, is a superb masterclass of Hogan's swing including a slow motion sequence (filmed in real time) from the side and behind and a grip lesson.